District Attorney George Gascon, who has the worst enforcement record on domestic violence cases in the Bay Area — dropping 6,200 out of 8,600 cases in recent years — now would like reinstated Sheriff Ross Mirkarimi to abandon his sheriff’s duties to oversee programs and responsibilities regarding domestic violence at the sheriff’s department. “I am calling upon Ross to recuse himself from the duties in his office that relate to the custody, supervision, safety and rehabilitation of domestic violence offenders,” wrote Gascon in a statement issued by his office on October 10, the day following the Board’s vote resulting in Mirkarimi’s reinstatement as sheriff. “I will not allow the clock to be rolled back on thirty years of progress in protecting victims of domestic violence. No victim of crime should fear that their call for help will go unanswered,” continued Gascon in his written statement. Exactly one week earlier, Gascon admitted in a KQED interview that he couldn’t explain his own Department’s poor record on domestic violence enforcement in which “more than three-quarters of cases are dropped before going to court,” according to a SF Public Press investigation. “And today I do not have an answer as to why” his department falls so far below the rest of the region during an interview. The number of dropped cases over the past several years totals in the thousands, according to records released to SF Public Press. “In the last five years, the district attorney’s domestic violence team reviewed about 8,600 criminal cases. Of those, they dropped about 6,200 before court,” it reported. CitiReport, in a February post, also obtained records from the Police Department and the District Attorney’s office showing that in 2011, when Gascon was DA, nearly 1,000 cases were dropped. The Public Press reported that the incidence of dropped cases actually increased under Gascon. The San Francisco Public Press pursued records from the nine Bay Area counties on domestic violence enforcement and found that San Francisco ranked at the bottom with only 28 percent of cases sent to the District Attorney then going to court. The city has a “no-drop” policy that requires prosecution even in cases where the victim refused to cooperate. 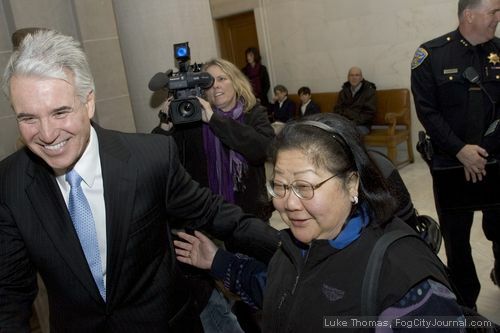 Gascon had cited the policy to explain his decision to prosecute Mirkarimi despite Eliana Lopez’ refusal to cooperate in an enforcement action against her husband. The gap is striking between the county with the strongest enforcement – Napa with a record of 179.1 cases per 10,000 residents – and San Francisco, lowest with 29.5 cases per 10,000 residents. The SF Public Press investigation includes vivid accounts of incidents with police testimony, photographs, witnesses and injuries but which nevertheless were dropped by Gascon’s office on the basis of insufficient evidence. “Police Department records show 3,515 police reports were filed, including 1,928 physical assaults with hands, feet or an object, 21 involving a gun and 40 involving a knife,” our post reported. “The District Attorney’s office informed the Police Department that it filed 245 misdemeanor cases and 240 felony cases out of the 3,515 police reports filed,” the records obtained by CitiReport showed. Over the past several years, cases involving high profile or politically connected individuals have been dropped. This includes a police report on Fire Chief Joann Hayes White, accused by her husband of hitting him repeatedly in front of their children, and felony charges against Julius Turman who was confirmed last summer as a San Francisco Police Commissioner. Turman settled out of court with his intimate partner for an undisclosed sum. Among those voting in August 2011 to confirm Turman as a police commissioner despite the domestic violence incident records provided to them were Board Chair David Chiu, Supervisors Scott Wiener, Mark Farrell, Sean Elsbernd, Malia Cohen, Carmen Chu – each of whom voted to remove Mirkarimi. No domestic violence agency opposed his confirmation. Gascon’s demand that Mirkarimi recuse himself from a list of duties outlined by Gascon appears to have little meaningful impact. There are no charter provisions that would suggest the District Attorney could demand an elected Sheriff abandon duties set in the charter. Meanwhile, Gascon has pledged to undertake a review of his own office to explain why his enforcement record has fallen to the bottom of the Bay Area and declined under his own leadership.